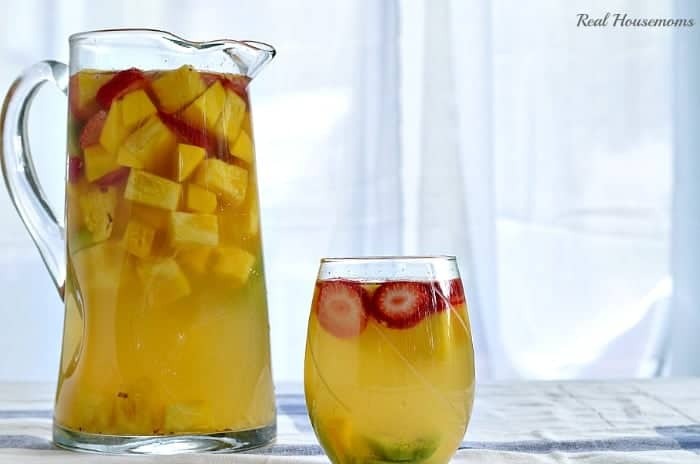 Tropical Moscato Sangria is the ultimate summer drink for entertaining. During the summer I like to sit out back and play cards with my husband and friends while we sip on cocktails. We have a really great covered deck that looks out into our backyard that’s just full of all kinds of plants, like rhododendron, oak and birch trees, as well as giant old pines. We just moved from the desert of Arizona so we’re still in awe of all the green and want to soak up as much as possible. Sangria is a great summer drink because it so fruity and refreshing. I love to serve it when I entertain because most everyone likes it and you can make it the day before. 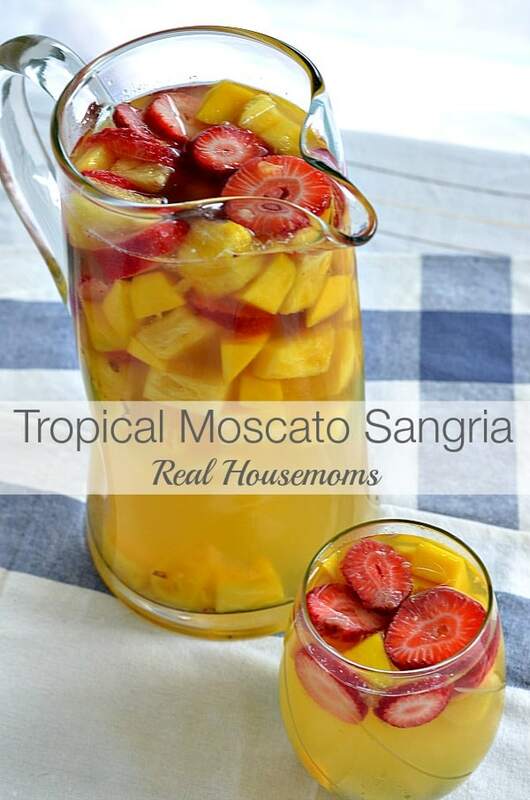 If you’ve following here at Real Housemoms you know that I LOVE anything make ahead for parties and this Tropical Moscato Sangria is no exception! This sangria is filled with fresh fruit as well as fruit juices and it really takes you away to a tropical beach somewhere. 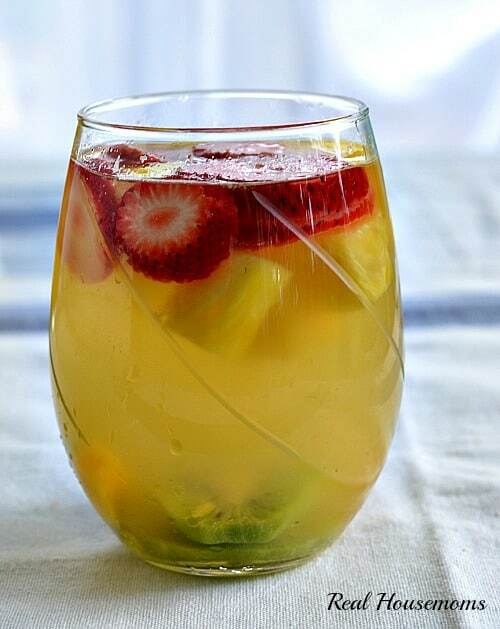 Tropical Moscato Sangria has fresh pineapple, mango, strawberry and kiwi! There’s no way you can go wrong there! My husband isn’t a fan of mango but he loved this drink. It’s definitely a must make this summer! This post and recipe was created to be published on RealHousemoms.com. If you’re reading it anywhere else, it has been stolen, please report it. Tropical Moscato Sangria is so easy to make and a real crowd pleaser! It's the perfect party drink because you mix it up the day before and it no one has to play bartender. This recipe was developed for RealHousemoms.com. If you're reading it anywhere else it was stolen, please report it. This would be an amazing addition to an Easter brunch! I deleted what I said earlier . I’m new at this but I like your recipes of the cheddar biscuits and the roasted shrimp and spinach recipe. I have to look for recipes for 2 people. Love this page. Made this for Easter. It is amazing! Thanks for the recipe!